HomeBank is a free application that lets you easily manage your personal finances as it includes all the necessary tools for analyzing your budget and expenses. The program lets you track the financial data for multiple accounts and essential information regarding your accounts, largest 5 spendings and scheduled transactions is displayed in three dedicated windows. 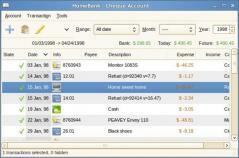 It lets you easily import bank statements using formats such as CSV, QFX, OFX and QIF. After you create and setup un account you can add financial data into the application and you’ll be able to view your available funds in real time. There’s also an export option that lets you save your account data in a QIF file, saved on your hard drive at a location of your choice. Users can anonymize their data to protect it from being accessed by unauthorized third-parties as well as sort your payees, assignments and categories. To track your future spendings, HomeBank allows you to set up scheduled transactions. Statistics can be viewed as various types of graphs by generating reports, which can be exported as CSV files for later analysis. Among other useful features included in the tool, you’ll find the ability to detect duplicate transactions, auto-numbering for cheques and the ability to create several account types such as bank, asset, credit card, cash and a few more.